Buddy Harman passed away at 8:30 PM last night in Nashville. He was hospitalized a few months ago. 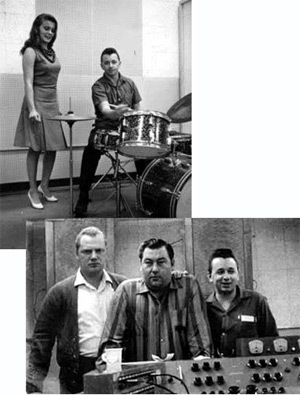 Buddy played drums on many of Elvis' hit records including "His Latest Flame" and "Little Sister". Harman has played on several legendary sessions, Roger Miller's "King of the Road," Johnny Cash's "Ring of Fire," Tammy Wynette's "Stand By Your Man" and Roy Orbison's "Pretty Woman" being just a small list. "Sorry to send you this bad news but, Buddy Harman has passed away tonight at 8:30. I'm glad you got to meet him. He was one in a million." In June of 1958, while Elvis was on two weeks leave from the Army, RCA scheduled what would be Elvis' final recording session of the 1950s. It was at their new facility on Music Row in Nashville. It was his final session until he came back from the Army and the first (aside from "Love Me Tender") to use "mainly" studio musicians. It was becoming the norm in Nashville and elsewhere that, in the studio, recording was done with the "house band", not the "touring band". The last sessions with the original band, aside from DJ Fontana, had been at Radio Recorders in February. The band put together by Chet Atkins consisted of Nashville A-Teamers Hank Garland on guitar, Bob Moore on bass, Floyd Cramer on piano and Buddy Harman along with DJ on drums. The Jordanaires were brought in on vocals with newcomer Ray Walker replacing Hugh Jarrett as the new bass singer with the group from then on. Scotty and Bill Black were not participants. Buddy Harman, one of Nashville's outstanding session drummers, has played his solid, driving beat on over 18,000 recording sessions in the last 40 years. Harman, along with only a handful of top musicians, is recognized by the Hall of Fame for creating the "Nashville Sound." This unique musical sound helped Nashville to become known as one of the top music meccas in the world. Besides being acknowledged by the country music community, Buddy Harman is recognized for contributing to the rock-and-roll era with his performance on many recordings including the Everly Brothers' "Cathy's Clown" and being a mainstay on Elvis Presley's soundtrack recordings both in Nashville and Los Angeles. He also played on many recordings by Roy Orbison and Jerry Lee Lewis. Harman has played drums on countless records with a variety of recording artists that reads like a page out of "Who's Who." These artists include: Elvis Presley, Patsy Cline, Dolly Parton, Brenda Lee, Tammy Wynette, Loretta Lynn, Roy Orbison, Connie Francis, Chet Atkins, Marty Robbins, Willie Nelson, Waylon Jennings, Lynn Anderson, George Jones, Kenny Rogers, Perry Como, Merle Haggard, Charlie Rich, Roger Miller, Jimmy Dean, Simon & Garfunkel, Ann Margret, Nancy Sinatra, O.C. Smith, George Burns, Reba McEntire and many others. Besides being the first staff drummer on the Grand Old Opry, some of Harman's accolades include: "Drummer of the Year" in 1981 from the Academy of Country Music, "Super Picker" award for drums on the most #1 recordings from the Nashville NARAS chapter in 1975 and 1976, and the Nashville Super Picker nomination for "Best Country Instrumental Performance" in 1979 for the Live From Austin City Limits album. "One of the highlights of my career was having the privilege of performing for four of our nation's presidents," Harman says. These presidents were John F. Kennedy, Gerald Ford, Jimmy Carter and Ronald Reagan. Buddy Harman, an accomplished musician, exemplifies the qualities of a true professional in the recording business. Harman has played on some of the biggest hits of Opry stars: Charlie Walker, Billy Walker, Jeannie Seeley, Hank Snow, Jim & Jesse, Roy Acuff, Roy Clark, Justin Tubb, Roy Drusky, The Carlisles, Mac Wiseman, Skeeter Davis, Vic Willis Trio, Wilburn Brothers, Jimmy Dickens, Osborne Brothers, Louvin Brothers, Jim Ed Brown, Wilma Lee & Stoney Cooper, Ray Pillow, Jimmy C. Newman, Jack Greene, Del Reeves, Johnny Russell, Stonewall Jackson, Porter Wagoner and Bill Anderson. He has played on numerous jingles, TV and radio shows and movie soundtracks. Harman has played on several European Tours with various artists including The Nashville Superpicker Band and Jerry Lee Lewis. As of May 1991, Harman is again the staff drummer at the Grand Ole Opry, in Nashville, Tennessee. On the pictues you see the A-Team: Bob Moore, Grady Martin and Buddy Harman. The lady besides Buddy Harman is Ann Margret. This is sad news. Playing with all those legends makes him a legend in music and drumming history. But, once again, they forgot to mention Jim Reeves. Naming all those performers... but no Jim Reeves. That's kind of sad. Jim and Elvis, supposedly, were friends. Hope we'll get to know more about the connection between Elvis and Jim in the forthcoming Jim Reeves biography. A great drummer and a nice man. I was lucky enough to meet him in 1985. He played on some of my favourite records. Long may his legacy remain. Sad news. A great drummer who will always be remembered. An amazing resume. RIP Buddy and thanks for the beat.